I.D. 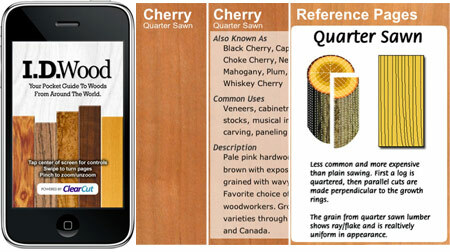 Wood is one of the first woodworking iPhone apps we think might be worth coughing up $2.99 for. Simply put, it’s an app that does just what the name implies — it helps you identify over fifty types of wood with full screen samples and a search function that helps you get where you’re going. It’s a standalone app that, once downloaded, doesn’t require net access, so if you’re somewhere the phone doesn’t have a signal you’re still good. Basically it will display samples and grain patterns as well as tell you what part of the tree it was cut from and how — plus all the more handy stuff, like woodworking properties and common uses. I downloaded it this weekend and took it to a few furniture markets in the local area to I.D. some of the stranger pieces I found, like a dresser that wasn’t labeled very well and had what turned out to be a Makore inlay. I found out it looks a lot like Cherry but the grain is tighter and somewhat rare around these parts, so it wouldn’t be a good candidate for my restoration project unless I wanted to rip out all the inlay and start again with actual cherry — so it saved me $85 right there. It’s pretty useful stuff and a cheap way to carry a wood guide along with you. Check it out if you’re in the market for a way to identify most of the commonplace (and even some of the rare) types of wood without a hassle. booo. I was expecting it to analyze a picture taken by the camera. cc, I thought of the same thing before I even clicked on your link. I purchased the I.D. Wood app and its GREAT! Sure there are books with similar and more detailed information but this App allows you to carry basic information and samples with you at all times on your iphone wherever you go. Those people without iphones will eventually be converted…so far 30 million iphones have been sold. As far as taking a picture and having the phone tell you the type of wood…it will happen eventually….just probably not anytime soon at an affordable cost. Buy I.D. Wood…..you’ll be surprised. I was.